What is more exciting than bright brilliant colors on an HDTV? The images of today’s televisions are fascinating and the options to blend them into your décor are plentiful. Imagine looking in the mirror one minute and watching TV from the same mirror the next minute. Better yet, imagine a painting with a beautiful wood frame hanging above your mantel and with a push of a button it turns into a TV. Other options include a TV that pops out of a cabinet or drops from the ceiling. Entertain outside? 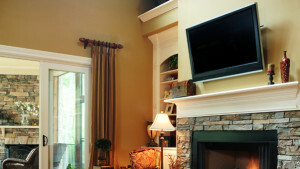 We offer a selection of outdoor TV’s that are perfect for that application. These options and others are possible and Press Play makes them happen.